If you’re thinking about a vacation, make it this one! 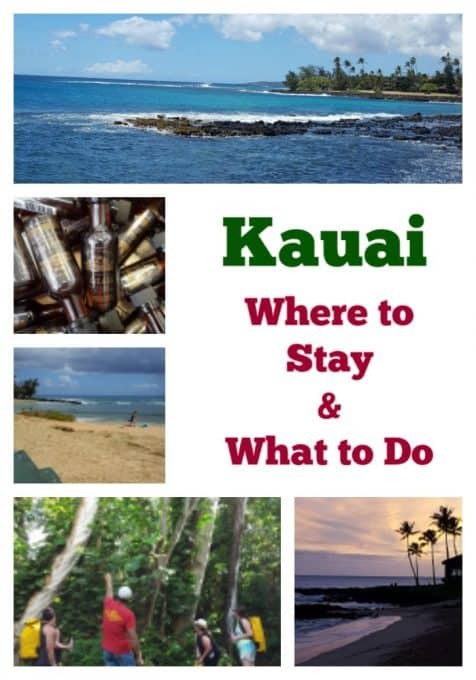 Kauai: Where to Stay and What to Do is about where we stayed and the things we did while on the island. There is so much to do that you can choose to make your island vacation a relaxing one, one full of adventure or a combination of the two! Thank you to The Villas at Poi’pu Kai for providing us with great accommodations during our stay and making our visit to Kauai possible! Last month I took what I would classify as the trip of a lifetime. If you’re at all thinking about going to Hawaii, I highly suggest you visit the island of Kauai. So peaceful and absolutely beautiful, and the natives are the most friendly of any place I’ve ever been. Last month, I was able to spend a full seven days on the island with a group of 7 lovely food bloggers and two of their assistants. It was one of the most relaxing, yet fun vacations I’ve had. I’ve got a total of three posts for you about my trip. In this one, I’ll tell you about where we stayed and what we did. Tomorrow I’ll tell you about the great places we ate. And finally, I’ll give you one whole post about our incredible boat tour – an experience you won’t want to miss! We arrived on a Wednesday which I really liked. Beginning a vacation in the middle of the week is something I would do again. Tourists mainly flock to the island mid-December through Easter and from mid-June to Labor Day. The resort we stayed at and many of the places we went weren’t busy and we really didn’t experience any road traffic. The weather was absolutely perfect. It rained here and there, but didn’t prevent us from going anywhere. There were mostly afternoon and night showers which moved through quickly. I suggest renting a car because there is so much to do around the island. For our entire trip, we were fortunate enough to stay at The Villas at Po’ipu Kai on the southern part of the island. Many of the restaurants we enjoyed and activities we did were close to the villas or at the most 45 minutes away, so we found the location to be very convenient. We had two villas for the group and they were absolutely beautiful. Each was fully furnished with multiple bedrooms and bathrooms, air conditioning, and a full washer and dryer! Both had a gorgeous and fully furnished state-of-the-art kitchen which very much impressed us food bloggers! 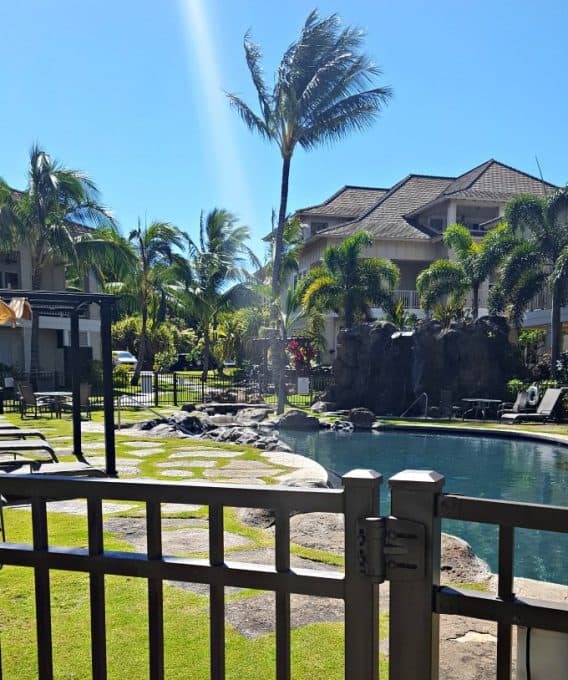 My favorite part…lanai doors that completely opened. 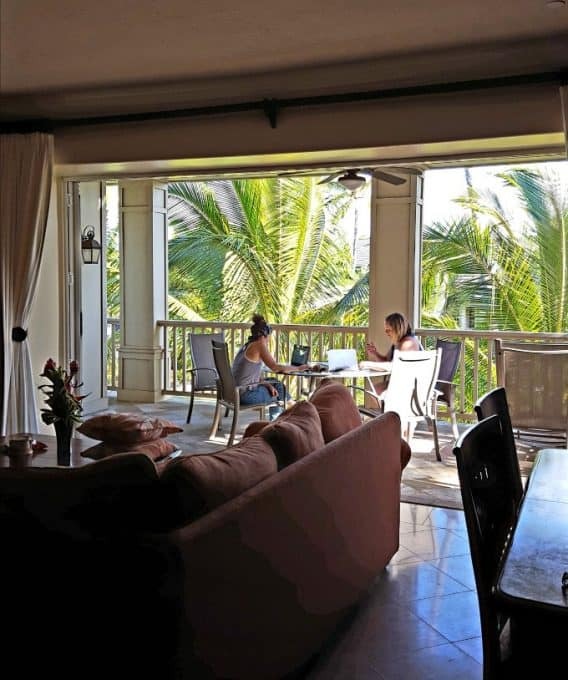 We could sit on the living room couch while enjoying the fresh Hawaiian air. It was magnificent! You can see Sandra from A Dash of Sanity and Aubrey from Real Housemoms hard at work here. See, we really do work on these trips! Of all the things we did, I found that this kayak tour combined with the hike was the most relaxing and a great way to see the island. The 7:15 am kayak tour along the Wailua river and hike to Secret Falls with Rainbow Kayak Tours is the way to go! Thomas was our tour guide and was funny and full of knowledge. Definitely ask for him when you go! The entire trip takes about 4 1/2 hours and is suitable for people ages 5 – 75, so the whole family will enjoy it. The kayaking was peaceful and the hike was beautiful. Wear your bathing suit under your clothes and bring sunscreen. I recommend wearing a pair of sneakers or good hiking shoes, NOT water shoes. They’re going to become a bit muddy and you’ll want something with a bit of traction as well. After the hike to Secret Falls, you can enjoy some swimming and lunch which is included in the price of the tour. The sandwiches were good, but that pineapple!! I have never tasted such incredibly good, fresh pineapple as we did that whole week on the island. Unbelievable! 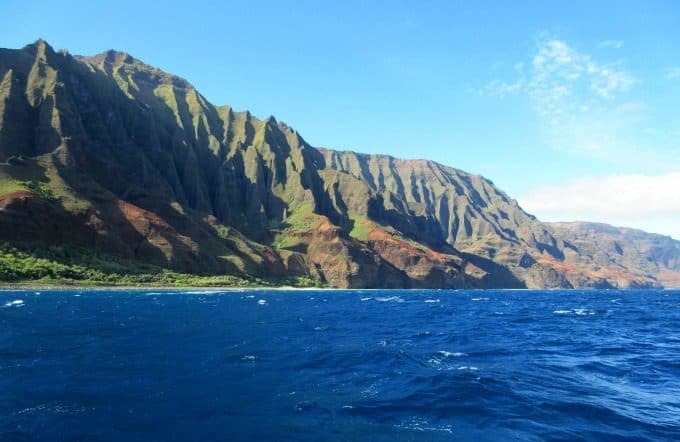 I would have to say that the boat tour that we took with Holo Holo Charters was right up there with the kayak tour. It was such a great way to see the island and because I grew up on the water, I was right in my element. There’s so much to talk about that this excursion deserves its’ own post, so look for it later this week! 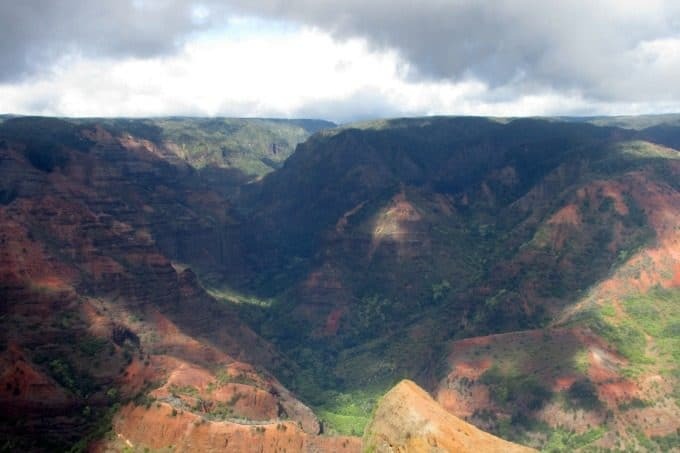 Located on the western part of the island is Waimea Canyon. I highly recommend you take a drive to see it as it is quite an unexpected site. For a land filled with such tropical landscape, it was fascinating to see how vastly dry and different it was.The terrain going up reminded me of our drives up to Flagstaff and other parts of Arizona. Once you arrived, you’re at the Grand Canyon of the Pacific. It is as though you’re looking at a miniature version of the original, but every bit as spectacular. There is a viewing platform from which you can see a waterfall and there are trails to hike as well. 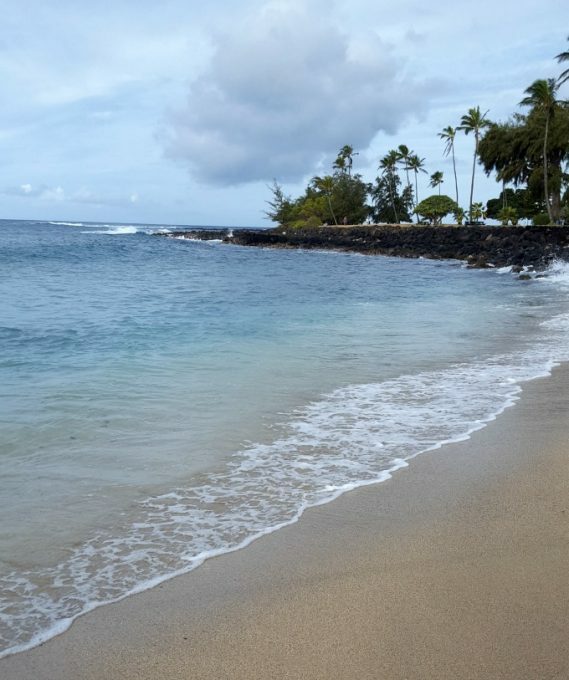 Of course, you’ll want to go to the beach while you’re there and Poipu Beach is one you won’t want to miss. It was absolutely beautiful. The sand was so soft and the water was the perfect temperature – Goldilocks would have loved it. There was a portion of the beach that was a bit rocky, but there’s a little inlet with a nice sandy bottom. There was a big turtle near the shore which fascinated many of the tourists. Remember if you see one while you’re there to NOT touch them. They are wild animals. It may be tempting to do so, but we need to respect their privacy and keep them safe. 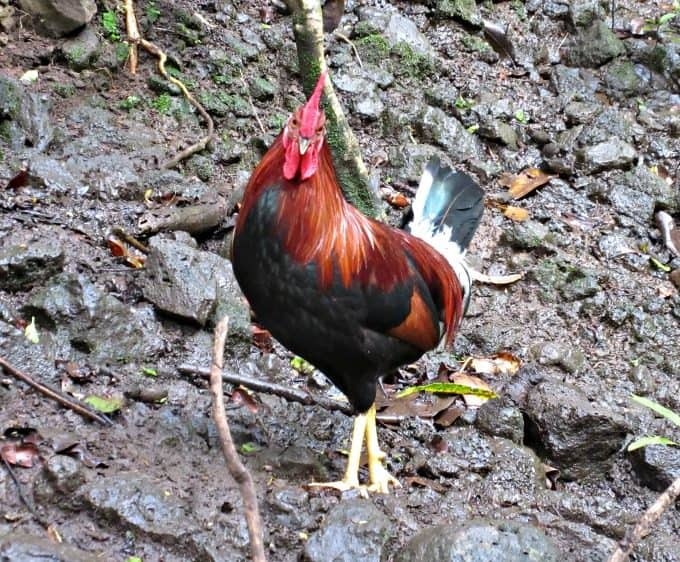 You’ll also see A LOT of wild chickens and roosters around the island. It’s pretty crazy! They just go about roaming the island. They’re everywhere. Another beach within a short walk from our villa was Brennecke’s Beach. It’s a small beach that’s good for bodysurfing with very soft sand and a gorgeous view. 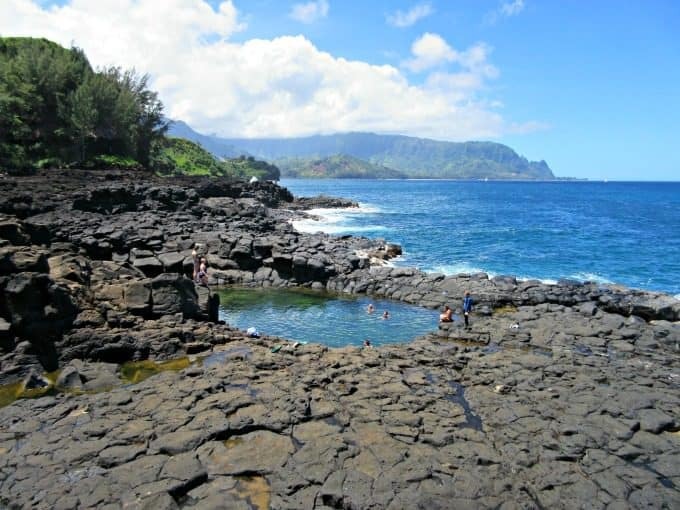 Although it’s not necessarily a beach, you won’t want to miss Queen’s Bath. Located on the northern part of the island, it’s a little swimming inlet that is very enjoyable to swim in. It’s a short, but somewhat challenging walk from the road. You’ll want to take some good shoes, not flip flops as it can be a bit steep in areas and muddy. There is very little parking, so you’ll want to go early in the day to catch a spot or park close to the golf course and enjoy a bit of a longer walk. Once you approach the rocks, you’ll see an area where the current is strong with waves coming in. There are people who swim here, but walk to the left for about 5 minutes and you’ll see Queen’s Bath. It’s calmer and you won’t have to worry about strong waves. 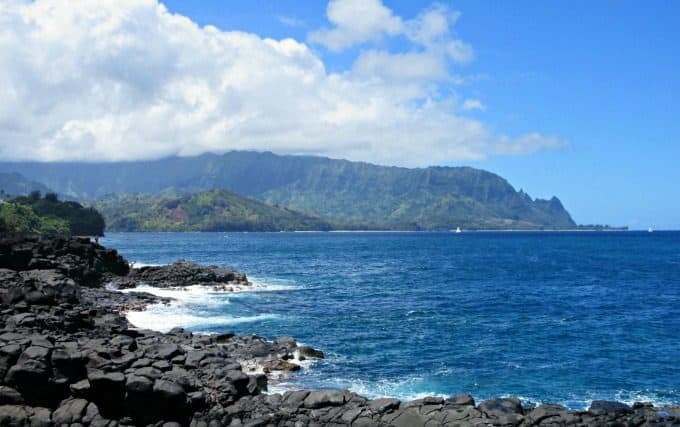 To experience the Polynesian culture at its’ finest, purchase tickets to the Auli’i Luau at the Sheraton Kauai Resort. Located on Kiahuna Beach, it is the only beachfront luau and is only a 5 minute drive from The Villas at Poi’pu Kai. The scenery was absolutely gorgeous and the sunset was spectacular. We couldn’t have asked for a more perfect location. The food was served buffet style and I enjoyed the Grilled Marinated I’o (Beef) and the Pineapple Upside Down Cake the most. The entertainment was fantastic. It was wonderful to see the Polynesian culture brought to life through dance. The dancers were so very talented and it’s something I’m sure your whole family would enjoy. 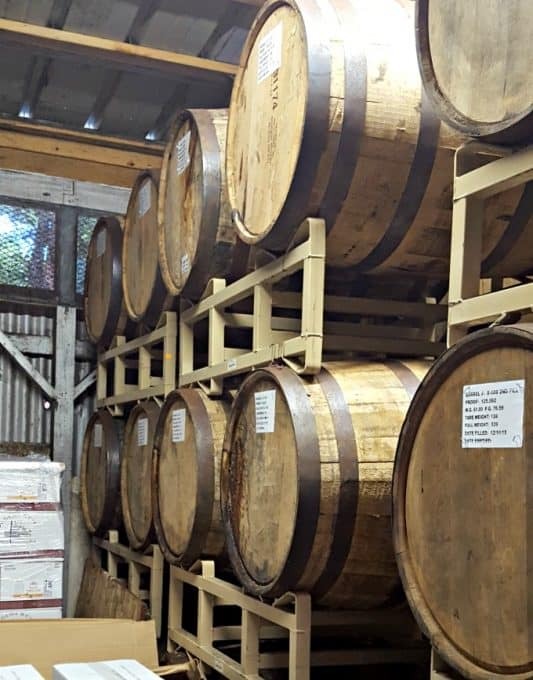 Being food bloggers, we were fortunate enough to take a private tour Koloa Rum Co. to learn how they craft it. I really enjoyed the Mai Tai’s at the different restaurants we went to because a few of them used the Koloa rum. They do have a tasting room and cute shop separate from where our tour took place at the Kilohana Plantation. It is a great way to sample their product, so be sure to check their hours! 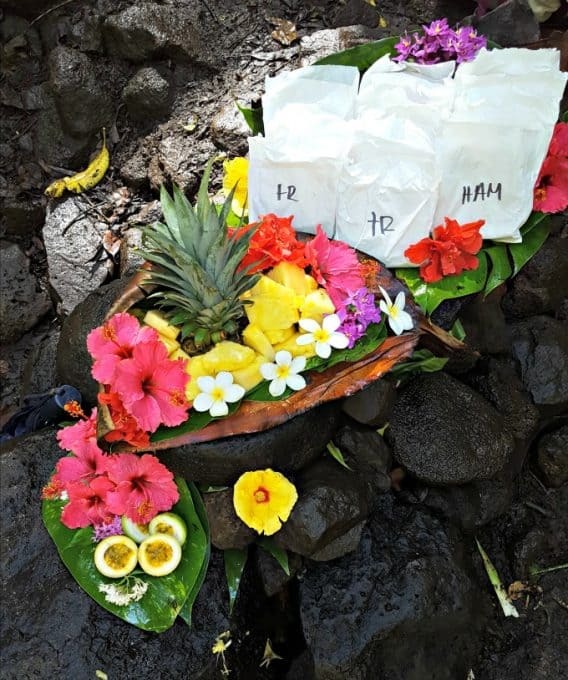 With so many great flavors, it’s difficult to decide which is my favorite.They have a Koloa Kauai Coffee flavored rum that I’m excited to work into a few of my recipes, so be on the lookout for it! Although I didn’t do this, but three of the ladies who were on the trip did and really enjoyed it. They said it was the highlight of their trip and by far, the best way to see the island. Rachael from Eazy Peazy Mealz talks about it here in her post, and tells you what you should and shouldn’t wear so that you have the best view. Come back tomorrow to see my post covering the great places to eat on Kauai AND I’ll have a recipe to go along with it! TRAVELING TO HAWAII? CHECK OUT THESE VIDEOS BEFORE YOU GO!